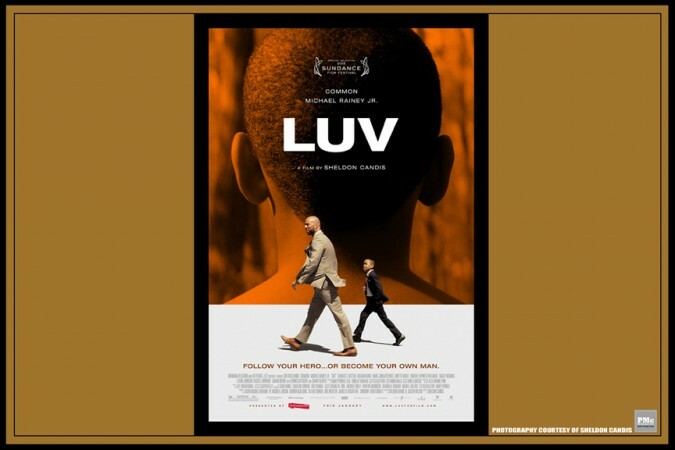 In the new film LUV, William “Woody” Watson, a shy 11-year old boy is forced to face the unpleasant truth about his only father figure during one harrowing day on the mean streets of Baltimore. This, the first feature film by Sheldon Candis, premiered at the Sundance Film Festival a year ago with a powerful gutsy story supported by an exceptional cast (including rapper Common, Dennis Haysbert, Danny Glover, Charles S. Dutton, Lonette McKee, and a child prodigy we’ll surely be seeing more of: Michael Rainey Jr.). The film will be out in American theaters this week, and the director has revealed how his first “LUV” came about. Chiara Spagnoli: What was your experience in filmmaking before directing LUV? Sheldon Candis: I moved to Los Angeles in 1999 to go to film school, USC, and the whole time I was just writing and creating my voice as a writer, with my writing partner Justin Wilson, and in the meantime learning as much as possible about filmmaking working on film sets, working as an assistant. I did that for over a decade. I always felt bad that my parents had to sacrifice to put me through such an expensive film education so I would work on sets to try to make money and be self-sufficient as much as possible. The story of LUV was always in my head and I had told Justin many years ago of being a young boy and of how my uncle had this side of him that I never knew about. He was an infamous kind of feared drug dealer on the streets of Baltimore, but I never saw this, I always saw him as my hero, my uncle, who was filling in the void of where my father wasn’t able to be present. He was an individual who taught me many life lessons and things that really shaped who I am as a man today. It was all about how we could take the true emotion of that relationship of being a young boy with my older uncle and how we could create a fictional story of cinema and fuse the two of them, but always have that heart. Yes , the film navigates crime and violence, but at the essence of it the core is about love. It’s about a boy’s love and adoration for his hero. CS: How does it feel to share on the big screen something so personal, private, and autobiographical? SC: We went back to where I’m from, to Baltimore, which is a major character and a major part of this story. The television series The Wire referred to it as the “forgotten American city” and I never embraced that, Baltimore is always the “beautiful American city” to me. We shot a scene in the neighborhood I grew up in. We shot in the Lexington market where faithfully every Saturday morning I had great times with my older uncles and cousins and grandfathers. Now, to be actually living out my dream as a filmmaker, making a movie about where I’m from, it is a really, really surreal experience. CS: How did you cast the actors? SC: I always felt excited about Common in the role. I always felt that he had it in him and that the roles that he has been given don’t really explore much complexity of character. He never really has had the opportunity to play a conflicted human being. But I always knew he could do it. I was so proud to see that everything that was written–the nuances, the layers of the character–was exemplified by him as an actor. He really managed to break through as a leading man. I always loved Dennis Haysbert, who has this certain thing about him which is earnest and plays Mr. Fish marvelously well, a bad guy with a good heart. I love Lonette McKee, she’s a legend of films, and Charles Dutton, all the years I’ve watched him, and of course Danny Glover. But when it came to the kid it was a true step of faith believing that the kid was out there and that we could find him. Michael is that kid, he’s a truly great discovery and talent. He’s wonderful. CS: How did you explain Woody’s role to Michael Rainey Jr.? SC: When I started making the film I was concerned about the well-being of Michael Rainey Jr. He is still a child. While I was exposed to things at his age, that made me lose my innocence while still rather young, and this young boy, who’s an actual person, who’s an actor, was actually going to experience in his real inner life so that when he would have finished making this film with us, he was going to lose innocence. He was going to grow up a lot in the process of making this film, and I was always very concerned about him and that aspect. I think he did a wonderful job as a young man and finding himself in that. And then also he bonded with everyone during the shooting, not only with the cast, but also with the crew members, so when we had spent 19 days together making the film, when it was all said and done, and we said that final phrase, “It’s a wrap,” Michael Rainey Jr., who considered all those people as a family, cried his heart out at having to say goodbye to all. CS: How was the movie’s production process? SC: It was very challenging. This is in the true essence and spirit of independent cinema. We made it for two dollars and a turkey sandwich. It’s tiny. That’s a true testament to all of the actors being emotionally invested and moved by the story, that they dedicated themselves, sacrificed themselves. Everyone across the board was paid scale. There’s that and then there’s the whole idea that you’re excited to get these wonderful actors, but then the AD has to work out the scheduling. It was a phenomenal job. We shot the movie in only 19 days. CS: The cinematography is really powerful. How did you and Gavin Kelly create the look of the film? SC: It takes a DP who paints with light and composition, and Gavin, he’s one of those guys. It was all about us getting together, watching movies, looking at pictures, photos, and things that really conveyed texture and mood and tone and the essence of what you’re trying to get across. I told him earlier that this is about the conflict between the boy’s wonder in how he sees the world and how it actually is. I feel like to Woody everything is bright and soft and has a level of innocence. From his point of view the city is beautiful despite the crime and violence that take place. That was the choice to shoot in widescreen and to capture Baltimore, “charm city,” that’s the nickname of the city, and it really is a charming place. CS: A year ago you got an excellent response at Sundance, and it’s soon going to be out in American theaters, where else is it traveling to? SC: I was really fortunate to premiere at Sundance and then it played in so many different places. I got to go to London, Paris, Panama, Seattle, San Francisco, Chicago, Baltimore, Savannah, Georgia. At film festivals you experience people’s reactions to the film immediately. CS: What was the most exciting thing about shooting LUV? SC: I would like to emphasize how wonderful it is to see this boy: Michael Rainey Jr. I can’t say enough about how special he is. Thematically, it’s about when all of us were children, and someone we looked up to as an adult, it’s that moment that those people, they let us down, or the moment in which the child can see the adult as flawed, but children have the ability to love them anyway, and that’s what the film is about. That moment we’ve all experienced, and how it shook us. CS: Are you working on a new project? SC: I’m working on a couple of things. The first thing is adapting a book called The Slave in the White House into a mini series, which is an Elizabeth Dowling Taylor book based on a true story. Many people don’t know that historically James Madison, when he became President of the United States, had a 10 year old man-servant, a slave of the name of Paul Jennings. Once again, I’m exploring the idea of a boy who’s experiencing a world, but here that world just happens to be the White House and his best friend just happens to be the President of the United States. I love coming of age stories. Sheldon Candis is a filmmaker whose first film LUV premiered at Sundance in 2012, and is about to be released in the U.S.